BIG SALE!! SMOKY QUARTZ BALLS SPECIALS BIG SALE!! 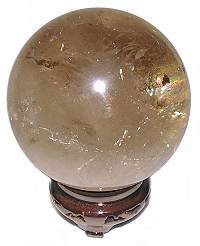 Superb AAA 85mm Smokey Quartz Crystal Sphere/Ball from Brazil. This sphere is 98% clear with 2 small separate areas of inclusions and some very light veils, with the rest perfectly clear. Lovely even medium dark coloring throughout. A gem for your for your collection. Good polish and finish with no cracks. The Oriental Rosewood Stand is sold separately. 60mm or 2 1/2" Sphere - 12ozs. Madagascar 63mm Clear Smoky Quartz Sphere is over 75% clear with only a hint of uniform pale smoky coloring. 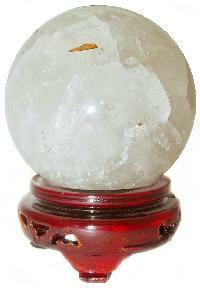 This quartz sphere has very light, filmy veils interspersed amid fine slivers of rainbow inclusions. Smoky Quartz has a gentle yet intense clearing quality that penetrates and dissolves habitual negative thoughts and feelings which contaminate daily life. Excellent polish and finish with no cracks. The Oriental Rosewood Stand is sold separately. 63mm or 2 5/8" Sphere - 12ozs. 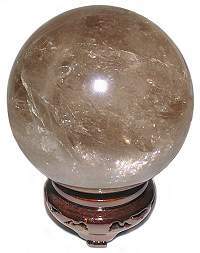 Large 117mm or 4 5/8" A Clear Smoky Quartz Crystal Sphere from Brazil. This sphere has a light smoky color with extra clarity, the light easily passes through the whole sphere. There is a small concentrated section of mirror like rainbow inclusions. 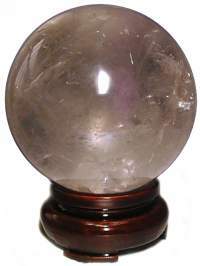 The rest of this sphere has very fine veils and phantoms distributed evenly in between large sections of very clear smoky quartz. excellent polish and finish. The Large Oriental Wood Stand is sold separately. 117mm or 4 5/8" Sphere - 4lbs 13ozs. Beautiful, very large 145mm or 5.8" Clear Smoky Quartz sphere has excellent clarity amid very dramatic rainbow inclusions which provide a great light show. This sphere also has some light veils and phantoms. 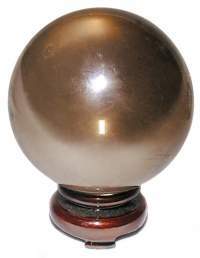 Smoky Quartz Crystal Sphere/Ball from Brazil with excellent polish and and no cracks. The 4" Large Oriental Wood Stand is not included. 145mm or 5 4/5" Sphere - 8lbs 7ozs. Semi translucent 85mm or 3 3/8" Milky Quartz sphere from Brazil with Dendritic brown leaf inclusions, has honey comb like sections of contrasting hues of milky inclusions. Quartz enhances the flow of life force, which nourishes and balances the mind, emotions, and physical body and corrects imbalances within them. Good polish and finish with only minor surface flaws. The Large Oriental Wood Stand is sold separately. 85mm or 3 3/8" Sphere - 1lbs 14ozs.